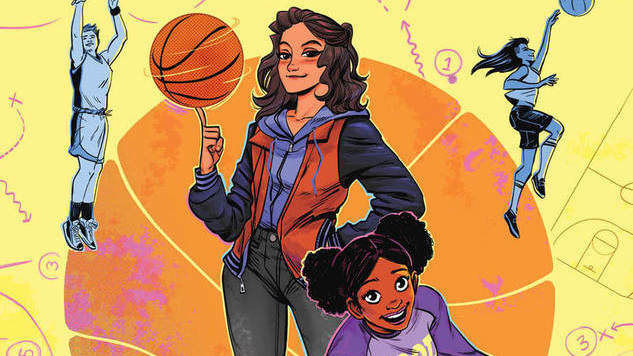 Back in September, Paste broke the news that Heavy Vinyl’s Carly Usdin and Wet Hot American Summer artist Noah Hayes were poised to hit the basketball courts with The Avant-Guards, a 12-issue maxi-series from BOOM! Studios launching in January. The story takes place at the Georgia O’Keeffe College of Arts and Subtle Dramatics, an historically all-female school more enthusiastic about the performing arts than its sports programs. Protagonist Olivia “Liv” Bates, budding actor and basketball player, doesn’t want to choose between theater and sports—and neither does new transfer student Charlie Bravo. Charlie was a star basketball player at her former school, and it quickly becomes Liv’s goal to recruit the new kid to Georgia O’Keefe’s ragtag basketball team and kickstart the first-ever basketball league for art colleges. The Avant-Guards #1 ships with a main cover by Hayes and a variant cover by Slam! artist Veronica Fish. The series joins breakouts like Giant Days by John Allison, Lissa Treiman and Max Sarin; Lumberjanes by Watters, Grace Ellis, Brooklyn Allen and Noelle Stevenson; and Goldie Vance by Hope Larson and Brittney Williams as part of BOOM! Studios’ BOOM! Box imprint. Check out Hayes’ interior art below, and be sure to snag The Avant-Guards #1 from your local comic shop or preferred digital retailer on January 23rd, 2019.